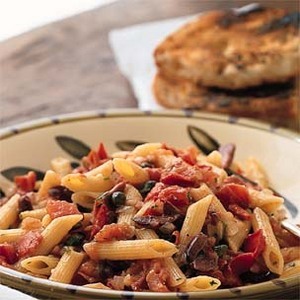 This recipe is like souped-up arrabiata sauce! The olives give it a distinctive taste. I got lots of compliments when I served this at my last two dinner parties. Heat the olive oil in a medium saucepan; add the onion and garlic and cook until translucent. Add the tomatoes, olives, capers, anchovies, red pepper, rosemary, salt, and pepper. Simmer for about 30 minutes. Stir in the parsley when ready to serve. Meanwhile, cook pasta to al dente. Drain (do not rinse). Pour sauce over pasta and mix well. Serve with fresh parmesan cheese.